As part of the class I teach on concert photography at Photoshop World, I go over a bunch of stuff that you shouldn’t do as a concert photographer. In my years of doing this, I think I have seen just about anything, but I continue to see behaviors and actions by photographers that leave me flabbergasted. Here is a quick list of things that you shouldn’t do as a concert photographer. 8. Turn off your flash and your camera’s modeling light. 7. Please don’t leave the giant lens hood on backwards. 6. Learn how to hang your cameras off your shoulder or your neck so that the lens doesn’t stick out sideways. 5. Pack appropriately, You don’t need 3 bags of gear for a bar shoot. 4. Don’t shoot video unless you are credentialed to. 2. Don’t push your way up front and then stand in front of the paying customers. 1. DONT HOLD THE CAMERA OVER YOUR HEAD WHEN SHOOTING. There are a bunch more… but honestly, some of the behaviors I’m seen this week are just crazy…. Please, please, please… Come to México and help me explain this to at least 90% of concert photographers that I see at every concert.., I have been shooting concert for about a year now and I’ve seen things I never thought of seeing or even remotely doing… How can we let them know it is just WRONG and Disrespectful? I know, i work in mexico city, and you can have from an elbow in your shot, to a frikin ipad and iphone. im not gonna start punching people, but i sure want to. I’m 100% with you my friend! It seems that every time in get worst, I have not had the chance to go shoot a concert in Mexico City but in GDL is getting worst every time since everyone has a digital camera and somehow they manage to get credrentials to concerts. We should start a movement against it hehe, I agree that everyone should be able to do this, but at least we should respect each other right? hay que hacer folletos hermano, y entregarlo a cada uno de estos culeritos que nos encontremos, pero nos puede salir caro las impresiones. It’s still OK if I shoot with my iPad though, right? Only if you lift it as high as your arm can go. I’ve seen a guy doing exactly what you wrote here, during my last seen Toto concert @ HMH. He ruined his flash when boucing to a wall, walking by. Not a good night for him I guess. An excellent list that should be printed on little cards and handed out as need arises. I love shooting concerts, but always dread the “front of stage” privilege – running in a constant crouch kills my thighs! And I’m always self-conscious about getting in someone’s view. IMHO, most concert and event photographers should be ninja – to be seen is to be shamed (and have a strobe set off in your face). A couple of other things to add to the list. 9. Don’t wear bright clothing that would be distracting to the artist on stage. 10. 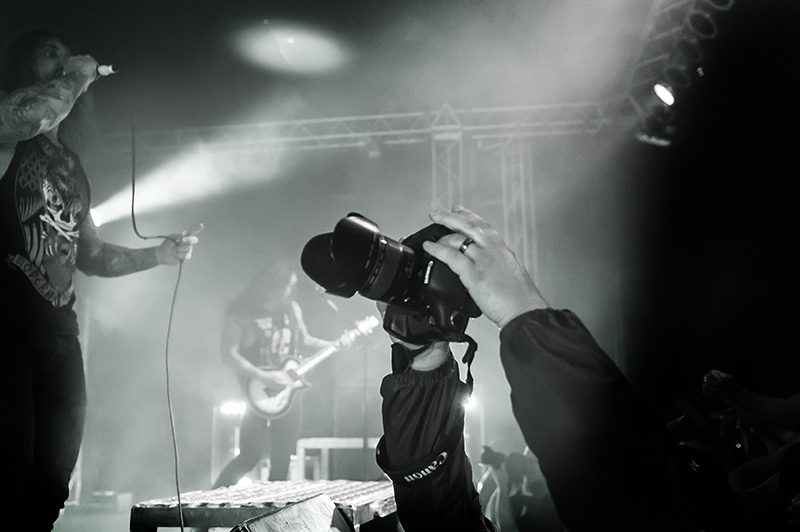 Don’t stand there and review every shot on your camera lcd screen while standing in the photo pit. Most venues give a three song limit and every minute counts. Shoot and move. Do you ever feel like it’s hard to move around to find new places for good shots without bothering the fans? When I go to concerts, it’s pretty annoying when the photographers won’t get out of my way, but I also feel like their shooting space is pretty limited. So many photographers don’t know about this stuff, it’s great that you take the time to teach them in your class. Thanks for the “do nots” I must admit I have held my camera up like the photo to get a unique shot- Never all that good. So never take up in the air hand held shot?